I’m so excited to be part of the fourth Virtual Vegan Potluck! It’s always so much fun reading through all of the creative recipes, but my favorite part is being included in this awesome group! Annie is just the coolest for setting all of this up. If I wasn’t married, I’d probably cook Indian food for every other meal. Okay, almost every meal. I’d probably only deviate to have Mexican food. And, since I’m living in California, I have the best Mexican food at my doorstep, almost literally, and I rarely have to cook it anymore. But Indian? Yes, I still have to cook that. But this is a great recipe for people who don’t like Indian food, because it doesn’t have turmeric or curry powder–any of those things that the curry-averse folks thinks equal “curry”. I won’t beat that dead horse again, but I’ve got problems with that frame of mind. So this one is just a delicious, slightly spicy item to add to a cheeseboard or appetizer nibbles tray. It’s not even really a “chutney” in the way that I usually think of a chutney. I think of a jam-like substance when I think of chutney, and this isn’t that consistency. It’s more of a paté, but even drier than that. Just make it—MAKE IT. I promise you’ll find that it is strangely addicting and yummy. 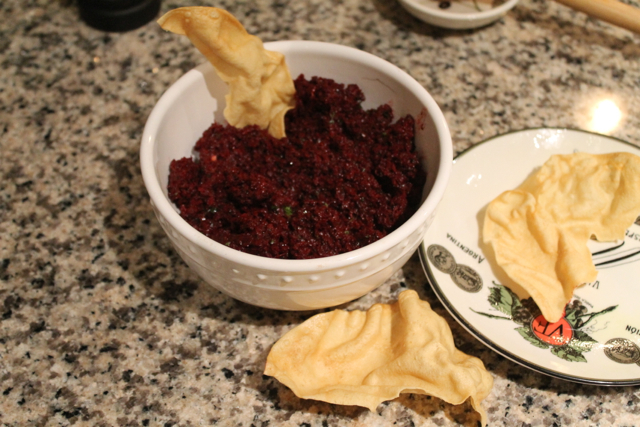 I serve it with poppadums, but you can always just use crudites or your favorite crackers. I’ve seen recipes for making poppadums from scratch, but believe me, it’s like Mexican mole. Just buy them and cook them yourself. You can find them at Indian or even English grocery stores, or try online. This is one of the few times I recommend using a microwave, as it makes cooking poppadums an absolute breeze! Brush them lightly with a neutral-tasting oil (I used almond oil), place on a paper towel and blast for about 30 seconds. Watch them expand into crispy crunchy tasty treats! Once I tried poppadums, potato chips lost all their appeal. Seriously, these things are crazy good. You have been warned…and as far as I can see, there’s no 12-step program to help you get that monkey off your back. 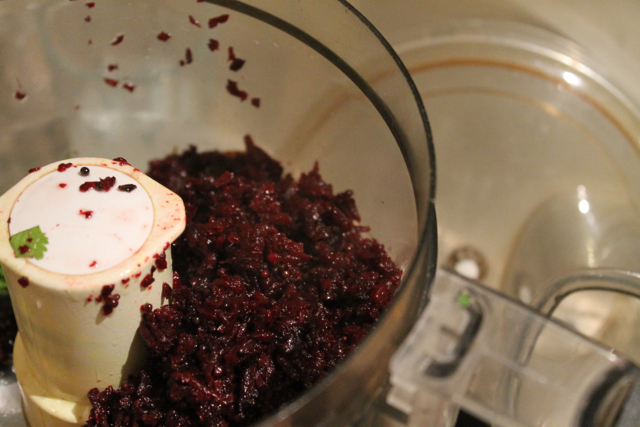 Go get out the food processor, grab a pair of gloves (those beets get messy!) and some mustard seeds, and get your chutney on. And then continue on to more vegan deliciousness! ++BTW, this recipe is vegan AND paleo–not always an easy trick to pull off. The poppadums, sadly, are not paleo. BOOOO. But carrot sticks are, so try veggie alternatives or paleo crackers instead. Heat the oil in a frying pan over medium heat. Add the mustard seeds, asafoetida, dried red chilies and green chili and stir fry for about 2 minutes. 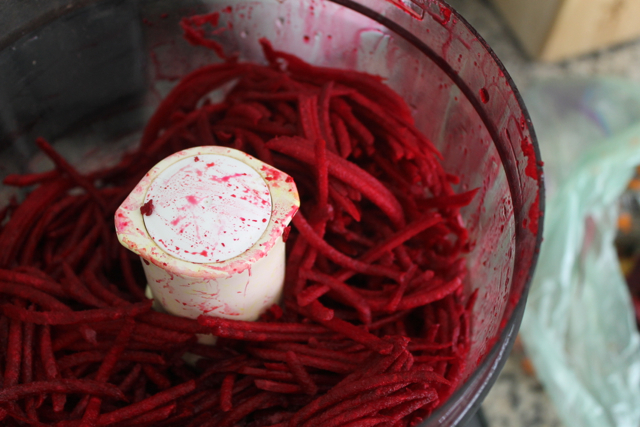 Add the beets and fry for about 5 minutes, stirring well. 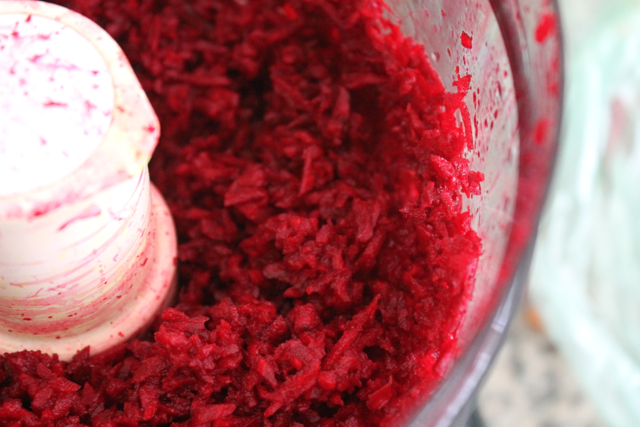 Combine the beet mixture with the rest of the ingredients in a food processor. Add 2-3 tablespoons of water and season with salt. Blend for about 45 seconds to one minute until it is well combined and the texture of a coarse paté. Enjoy with poppadums, crackers, carrot and celery sticks, jicama, or even potato chips. This would also make a great filling for samosas! I hope you enjoy this recipe! Now get on to the rest of the Virtual Vegan Potluck—you’re only on Appetizers, and there’s a LONG road of delicious treats ahead! Enjoy the journey! Did you miss Eat Well. Party Hard? Forge ahead with Eat, Live, Burp! This sounds delicious! Especially with the tamarind and cilantro. Now I know exactly what I’m going to do the next time I buy beets! Wow! What an awesome comment! Let me know how you like it! I will! My favorite is coconut chutney, but I occasionally like to go all out and make more than one kind of chutney at a time… I’ll add this to the rotation! Wow, thanks! 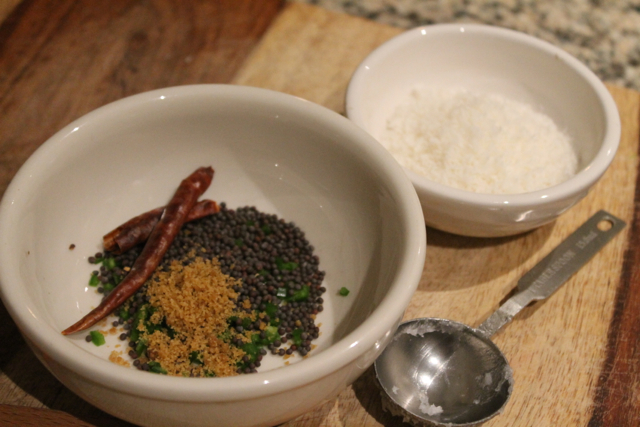 And this has a but of coconut in it, so it should be a great complement to your coconut chutney. I’d love to see your recipe! Thanks for dropping by and commenting! Is it crazy that I’ve never actually had chutney before? Yeah! This is awesome. I don’t think it’s crazy! Chutney is kind of a crazy thing. I hope you give it a try –and thanks for taking the time to comment! 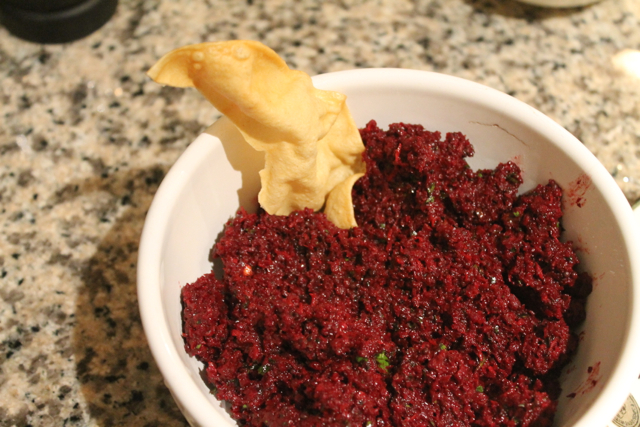 I LOVE Indian food – so maybe, just maybe you’ll convince me that I can love beets :-). Good tip! Yes, I really wanted to see what people would do :-). Looks so good. What is “asafoetida”, I have never heard of it? What can you recommend as a substitute. It’s a ground root used a lot in Indian cooking. You can use a little minced garlic instead! I hope you like it! It’s quite dry for a chutney, but makes a lovely pre-dinner snack! I will never say no to Indian food. Never. Very cool recipe! Neither will I! Kindred spirits. I hope you try it! It does sound strangely addicting, and I do love beets. So gonna give it a try! It should be easy for you to find the ingredients in LA. Do let me know what you think! I’d love to try it with golden beets too. Omgee! That’s oozing with yumminess! Love it! What a compliment coming from YOU, vegan food goddess!!! Can’t wait to see what you’ve come up with on the VVP. something amazing, I’m sure! I am totally with you one this! I could eat Indian or Mexican every day too! And I love beets! So I will certainly give this one a whirl! I love Indian food and beets! What a great appetizer. Thanks for sharing and happy VVP! PS~Those snickers bars from May VVP were one of my favorite recipes! OMG that’s so kind of you! The Husband loves them so much I have to make them all the time. I did improve the recipe, so check back on it–toasted almonds…❤️!!!! Thanks for the heads up! Almonds are my favorite nut, yum! SO much better than the peanuts in the original recipe! yummy! i love thuvayal and this one is beautiful. rice and appalam are calling my name to pair with this lovely thuvayal. I most definitely share in your sentiments about indian food. I’m seriously intrigued by this dish, so vibrant and such a tasty mix of flavours. Kindred spirit! Thanks for the comment–do let me know what you think if you try it! Yum! I love chutney on almost everything! 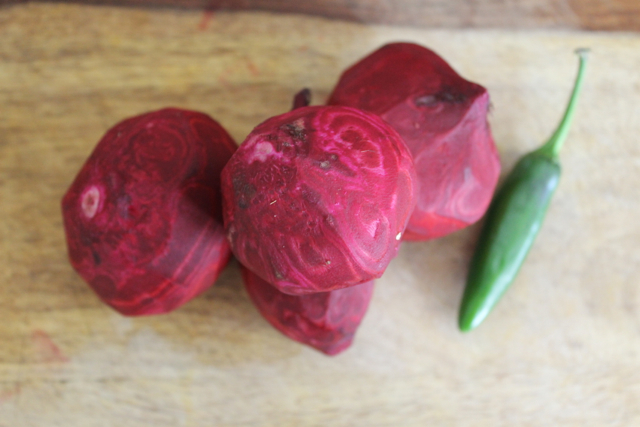 Beets are such a perfect ingredient, sweet and gorgeous! Thanks you. I hope you try this recipe and let me know what you think of it! It is a lovely savory treat. So may flavors 🙂 Love the creative use of beet. Wow what a great colour and loving the flavour combo! This DOES make me hungry! Can’t wait to try it! Thanks! I just had a bit more last night–it lasts really well! You’re a woman with excellent taste. Have a great Thanksgiving! I’m sure you’ll be cooking up some wonderful dishes. wow, what a healthy dip chutney! i feeling healtier just by reading this post……. Yes, the lack of sugar makes it different from other chutneys, and probably more healthy. Thank you! Always hungry and always on the look out for my next snack! would it be very bad if I was to call this the ultimate dip? We have some great varieties of fresh beetroot available in the shops. They’re simply steamed in their natural juices and vaccum packed ready to go, they’d be pretty phenomenal in this chutney!